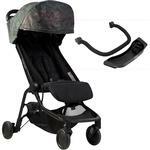 Dual functionality of car seat compatibility. Perfect for todays busy, travelling modern families. 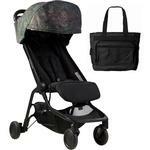 A truly lightweight, compact folding travel stroller that offers an authentic Mountain Buggy experience. The nano travel stroller provides dual functionality of car seat compatibility to easily transform into a fuss free urban stroller - perfect for todays busy, travelling modern families. A 1st class stroller, the Nano is the ultimate travel stroller that promises convenience, longevity of use and the authentic Mountain Buggy experience of ease and 1st class safety innovation. Lightweight at less than 13 lbs and measuring just 22 x 12.2 x 20" when folded, this lightweight travel stroller meets carry on luggage restrictions for planes, trains and automobiles. Unfold with a Flick - When you arrive at your destination, flick nano open with just one hand to unfold and continue your journey. 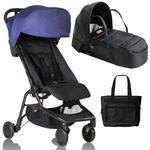 Perfect for those quick errands with your baby in the city. Travel System Ready - Equipped with an on-board car seat adapter, nano converts to a travel system, accommodating most leading car seat brands* including Mountain Buggy protect. Travel easy with your newborn baby in their car seat and nano. 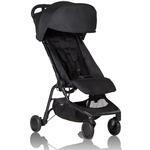 Rear wheel suspension - This travel stroller features inbuilt rear wheel suspension, absorbing bumps on the road and keeping your baby comfortable on their travel adventure. An easy push pedal brake with colour definition shows when youre safely parked or ready to roll. 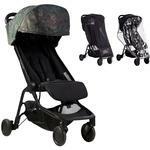 Smooth to Maneuver - 6" EVA wheels provide a smooth ride, offering less chatter than other travel strollers with inferior wheels. 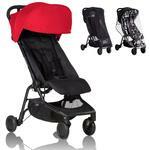 The 2 front wheels can be locked straight, or swivel for maneuverability in tight spaces. Ideal for busy airports and train stations. Style and Function for the seasoned traveler - With a full sized seat, nano offers longevity of use that other travel strollers cant. Keep your baby comfortable up to 4 years of age with a multi-height padded safety harness and a 2 position seat recline with ventilation panel. 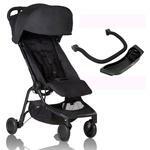 An adjustable leg rest offers enhanced circulation and comfort for your baby on their travel adventure, and a generous sun canopy with flip out sun visor keeps harsh sun rays from their delicate eyes. 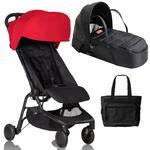 For all those travel essentials, an under-seat gear tray accommodates up to 11 lbs of baby gear. Outstanding Kerb Pop - Never underestimate the power of curb pop! Cleverly engineered with perfect weight distribution for optimized performance, nanos ultra lightweight handling allows you to pop the front wheels up for curb hopping on your travels. A first class, compact folding travel stroller that offers an authentic Mountain Buggy experience. The nano travel stroller provides dual functionality of car seat compatibility to easily transform into a fuss free urban travel stroller - perfect for todays busy, travelling modern families. 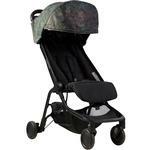 Custom fit weather covers for your nano travel stroller. This set includes both sun mesh and pvc storm cover. 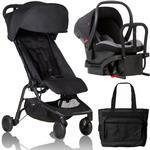 Turn your mountain buggy swift stroller into a stylish pram with the mountain buggy swift carrycot. With a soft mattress and cushy padded sides, baby sleeps in peace while you enjoy shopping or meeting up with friends. For bright days, a sunhood shades your little one's baby blues. 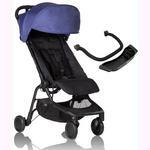 Attach the included storm cover to protect your sleeping angel from wind and rain. 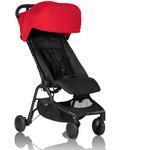 The mountain buggy swift carrycot is suitable for newborns up to 6 months. The fabric easily wipes down for those inevitable baby messes. 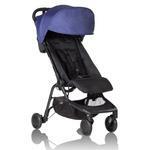 The simple click attachment system makes the carrycot portable to take your baby anywhere.